In a report on its audit of Global Fund grants in the Republic of Chad, the Office of the Inspector General (OIG) said that additional safeguard measures have helped “to reduce, but not sufficiently mitigate, significant financial and programmatic risks,” raising questions about the effectiveness of the technical assistance provided by the Global Fund and the flexibilities granted to Chad to implement grant programs. Chad is a landlocked, low-income country with a gross national income (GNI) of $720 per capita in 2016. It has been categorized as a “Core” portfolio, which typically means a larger funding envelope, a higher disease burden and higher risk. HIV prevalence has fallen from 3.3% in 2010 to 1.3% in 2017, and there has been a decrease in new HIV infections. Malaria remains the most common cause of consultation, hospitalization and death, and the TB incidence rate has been stable for 10 years at 153 cases per 100,000 people. At the time of audit, Chad had three active grants, one each for HIV, TB and malaria, with a total signed amount of € 97.2 million. Chad has been classified as a challenging operating environment (COE) due to its weak infrastructure, insufficient human resources for health, and security challenges. Since 2013, neither the HIV grant nor the TB grant have been rated above B1 (adequate), while the malaria grant has gone from being rated B2 (inadequate) in 2016 to A2 (meeting expectations) at the end of 2017. In order to minimize risk and achieve program objectives, the Global Fund invoked the Additional Safeguards Policy (ASP) back in 2009 to improve principle recipient (PR) accountability and leadership. The OIG audit covered the period from 1 January 2016 to 31 December 2017 and included all active grants for the three diseases (see Table 1). The OIG found a need for significant improvement in two areas: First, measures implemented under the Additional Safeguards Policy; and second, implementation arrangements to support sustainable attainment of grant objectives. The audit sought to give assurances to the Global Fund Board that controls and processes related to Chad’s Global Fund grants are adequate and effective. However, the audit found that initiatives such as implementing a fiscal agent, putting in place a limited cash policy, recruiting a procurement agent, and providing support for capacity building have not resulted in improvements related to the grants’ performance indicators. In addition, the OIG found serious weaknesses in service quality and data stemming from the low capacity of the PR to oversee the implementation of HIV and TB grants. The OIG referenced the previous audit carried out in 2010 which recommended a stronger role for the local fund agent (LFA) based on the overall conclusion that the OIG was unable to provide the Global Fund Board with reasonable assurance of the effectiveness of controls in place to manage risks. All agreed management actions (AMAs) resulting from that audit –– including those related to oversight by the fiscal agent –– have been implemented. For the most recent audit, the OIG said that the LFA provided assurances that the funds are being used as intended and that the fiscal agent’s assessments are informing the country team’s decision-making. New infections and AIDS-related deaths fell by 8% and 16%, respectively, between 2010 and 2017. Other achievements include initiatives aimed at improving future programmatic impact. To this end, the Global Fund has finalized a supply chain diagnostic in Chad which will be used to improve treatment access and service quality. Additionally, the HIV and malaria programs are piloting an initiative to train community health workers as a way to address the shortage of health personnel. Lastly, a UNDP capacity-building plan to prepare the Ministry of Health (MOH) to take on a PR role for the malaria grant is being implemented, but with delays. Originally, it was planned that the MOH would become PR for the 2018–2020 implementation period, but they are now aiming for 2021–2023. The OIG also noted that despite many challenges, Chad’s Global Fund programs have increased their capacity to absorb funds. The Global Fund’s investment in oversight through the implementation of a fiscal agent has played an important role in mitigating the misuse of grant funds. However, despite this, external auditors and the LFA continue to find inadequate supporting documents for some payments. The most recent LFA review found ineligible expenses in the amount of € 1.9 million, signaling ineffective PR accounting and reporting processes. In addition, the switch from a zero-cash policy to a limited-cash policy in 2016 has resulted in delays or non-execution of key activities. The zero-cash policy enabled the PR to make direct payments to third parties without passing through sub-recipients (SRs) and sub-SRs (SSRs). It was replaced with the limited-cash policy, which requires SRs and SSRs to justify 80% of advance payments received with adequate documentation before any new disbursement takes place. The OIG found that the PR was inconsistent in its application of the policy and was not making adjustments in accordance with program priorities. This has resulted in some SSRs receiving disbursements despite their inability to justify their expenditures in advance, while other SSRs are penalized due to the underperformance of a few SSRs (even under the same SR). Investments in technical assistance have “failed to deliver meaningful improvements due to the lack of a clear assessment of needs, of a definition of performance indicators against which to gauge progress, and of an exit strategy or roadmap for completion of the support interventions,” the OIG said. Also, the OIG found that there are important gaps in the quality of services provided by the national disease programs. This is due to (a) weak implementation and supply-chain arrangements; (b) a persistent financial crisis that hinders the Chad’s ability to meet its co-financing requirements; and (c) gaps in the PRs’ oversight of grant implementation. The OIG explained that although the national programs are serving as SRs of the two PRs, FOSAP and the UNDP, the national programs have no formal authority over the MOH’s regional structures in charge of providing health services. Chad’s failure to meet its co-financing requirements has led to gaps in the distribution of bed nets to prevent malaria. Further, Chad’s data collection process is still paper-based and unable to accommodate Global Fund data disaggregation requirements. In addition, both PRs lack the formal authority from the MOH to oversee the data reporting process. For example, national hospitals report data directly to the Ministry of Health and do not necessarily share data with the national program. Moreover, the data validation process is overly dependent on supervision activities which do not happen frequently enough or do not cut across all regions. The result is inaccurate and/or incomplete data which then leads to incorrect performance reporting. The OIG and the Secretariat have agreed on four AMAs which the Secretariat will implement (see Table 2). Review the terms of reference of the fiscal agent to identify areas where the agent can be more efficient and effective, including ensuring that terms of reference prescribe key performance indicators for each agreed objective. Develop a corporate approach on the performance management of fiscal agents and a communication protocol on the periodic performance reviews. The target date for completion of the AMAs is 31 December 2019. 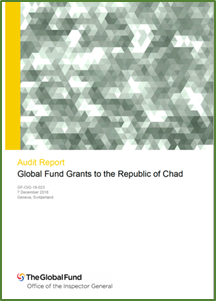 The OIG’s audit report on Chad is available on the Global Fund website.